Sir Chris Hoy, Victoria Pendleton and Shanaze Reade were among the gold medal hopes named in Britain's cycling team for this summer's Olympics in London. Eighteen riders were confirmed for track, mountain bike and BMX, with 14 named on a shortlist for road cycling. David Millar, banned for two years in 2004 for taking performance-enhancing drugs, is on that provisional list. The men's road squad will be reduced from eight to five, and the women's from six to four, later in June. Team GB will number 27 in total across the four Olympic cycling disciplines, with British cyclists hoping to match the 14 medals and eight golds won in Beijing. "I think it's always hard, although the first names on the team-sheet pick themselves," British cycling performance director Dave Brailsford told BBC Sport. "When you get down to the last names it's always closer and I think that's where you really have to think about maybe the difference between an experienced athlete or a younger athlete with one eye on Rio [2016 Olympics]. "So there were always challenges but we're pretty happy with the team we selected." Hoy won three golds in 2008 but it has not yet been confirmed whether he will defend all three titles, with his place looking assured in the team sprint and keirin but Jason Kenny pushing hard for the lone spot in the individual sprint. "The standard in the British Cycling team is so high and the selection process is always going to be tough, but there's a great atmosphere in the team and we just need to keep putting in the hours in training and make sure we're in the best shape possible for race day," said Hoy. "This is my fourth Olympics, but my first home Games, and it's going to be an amazing experience and a once-in-a-lifetime opportunity for all of us." Hoy and Pendleton, who won individual sprint gold in Beijing, will end their careers after the London Games. Tour de France contender Bradley Wiggins is included in the road squad, with Mark Cavendish strongly tipped to win Britain's first gold of the Games when the road race takes place on the opening Friday. Defending champion Nicole Cooke is among the women's group on the road, although Lizzie Armitstead is vying with the Welsh rider for the position of team leader. Three-times BMX world champion Reade will hope to make up for the disappointment of crashing in Beijing when favourite for gold. "If the test event and the recent World Championships in Birmingham are anything to go by, the home support will be a massive boost to me," said Reade. "I feel that I am in good form at the moment and I'm really motivated for this. I just can't wait to race." Liam Phillips is to be given every opportunity to prove his fitness and take the men's place after suffering a fractured collar bone at last month's Birmingham World Championships. Annie Last effectively sealed her place at the Olympics with a top-10 finish at last month's mountain bike World Cup event in France, and Liam Killeen will take Britain's place in the men's event. 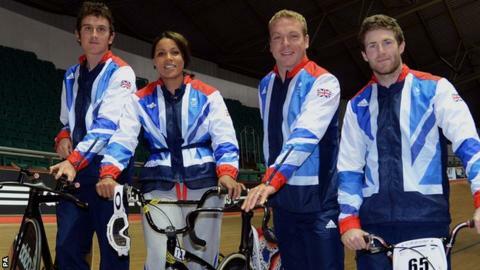 Sprint: Philip Hindes, Sir Chris Hoy, Jason Kenny, Victoria Pendleton, Jessica Varnish. Endurance: Steven Burke, Ed Clancy, Peter Kennaugh, Andy Tennant, Geraint Thomas, Wendy Houvenaghel, Dani King, Laura Trott, Joanna Rowsell. Men (five to be selected): Mark Cavendish, Steven Cummings, Chris Froome, Jeremy Hunt, David Millar, Ian Stannard, Ben Swift, Bradley Wiggins. Women (four to be selected): Lizzie Armitstead, Nicole Cooke, Katie Colclough, Sharon Laws, Lucy Martin, Emma Pooley.